Praise the beer gods of North Texas, Armadillo Ale Works tap room & brewery will officially open its home in Denton! After some setbacks and delays, the brewery is under heavy construction and planning on opening its 18,000 square-foot location some time later this Winter. They'll announce an official release date as the final permits roll in and they are closer to opening. In 2010, Bobby Mullins & Yianni Arestis won third place in the Murphy Center for Entrepreneurship’s 2010 New Venture Creation Contest via the College of Business at the University of North Texas. Their idea was to bring a craft brewery to Denton. In 2011, they raised more than $34,000 via a Kickstarter campaign and decided to roll with their business plan. The team partnered with Deep Ellum Brewing Company in late 2012 to help get their beer on the market while they continued to raise funds for their business operation. Armadillo Ale Works brews became available throughout Denton and D-FW by early 2013. 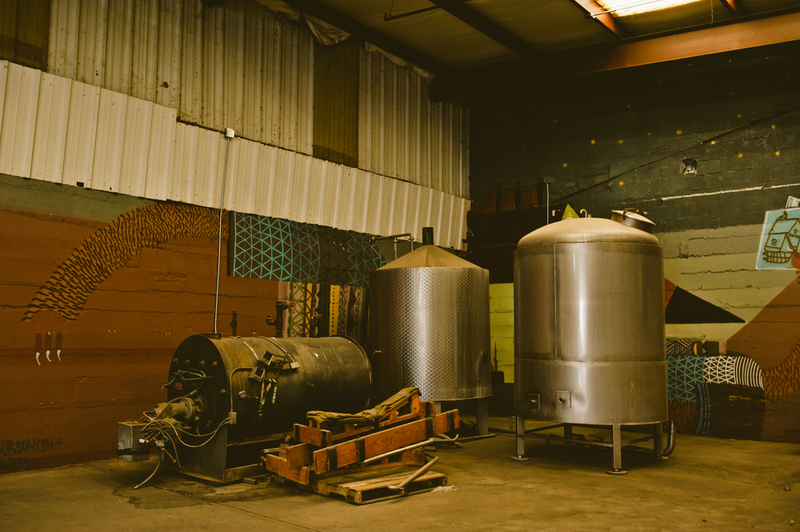 In early 2015, after a couple of years of brewing in Deep Ellum, Armadillo Ale Works announced they would be moving their business back to Denton where it originated, with a planned open date of Summer 2015. That first location wasn't ideal so Armadillo Ale Works signed a lease on more preferable downtown Denton warehouse on South Bell Avenue later in 2015, at the former pop-up venue known as The Hive. Arestis and Mullins had looked at this space several years ago, but due to the zoning laws in Denton at the time, the space could not be opened as a craft alcohol production location. Now, however, it can be! Yay! The 5,000 square foot taproom will sit inside in addition to a 2,000 square foot outside covered patio. The future taproom sits in the remains of an old, abandoned muffler shop, where Arestis says they plan on keeping as much of the original building intact as possible. They are tearing the roof off and expanding it upward by a couple of feet, though. Construction has already begun on their new site that is conveniently located next to Denton’s newest and most delicious Latin street food joint, Boca 31. Soon you will be able to get a pint (or two) of Armadillo Ale Works award winning brews and the best street tacos in Denton. We like this, a lot. By the time the brewery opens, there will be a new parking lot that expands behind Boca 31. Their newest brew, Honey Please, will be tapped at East Side on Friday at 6 pm. Come and get your first taste of heaven, folks! “Honey Please is easy to drink and smooth, just like every other good, blonde ale,” Arestis says. Despite not having any spices or cinnamon added, there is a spiced flavor and aroma upon sipping. Arestis says that Mullins secret weapon for this flavor twist is mesquite beans. Photos and header image design by Shaina Sheaff.